Ceremonies are held Mondays to Thursdays 9:00 am to 4:00 pm, Fridays 9:00 am to 3:00 pm and by special appointment on Saturdays between the hours of 9:00 am to 4:00 pm. Couples using the service must bring along their witnesses, who should be 18 years or older, and brides may choose to wear traditional white wedding gowns, complete with veil and bouquet. 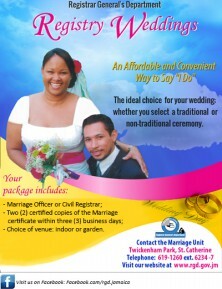 Bride and groom must be residing in Jamaica for a minimum of 24 hours before ceremony.